From virtualization and cloud computing to unified communications and collaboration, DynTek provides professional technology solutions across the three core areas of your technical environment: Infrastructure/Data Center, Application Platforms and End Point Computing. Today's threat landscape is moving fast. Security threats are escalating at an alarming rate, with more than 70k new pieces of malware identified each day. Well-funded cybercriminals are creating sophisticated malware that are designed to circumvent current security solutions by loading before the operating system and evading traditional antimalware protection. These unknown stealthy threats are bringing risk exposure to unprecedented levels that require a new approach to security. 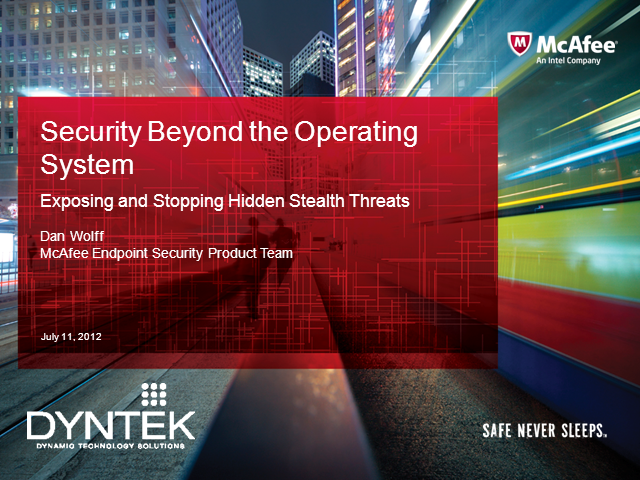 McAfee and Intel are taking a new approach to security. With the announcement of McAfee DeepSAFE technology, McAfee and Intel deliver a new level of hardware-enhanced security that provides unprecedented protection for a safer, more worry-free computing experience from device to the cloud, from a brand you trust. With integrated security solutions from McAfee and Intel, you can get the added layer of protection you need to prevent attacks while effectively managing security out to a network of endpoints. How these new security solutions can be deployed alongside of your existing security investment to further your security posture.